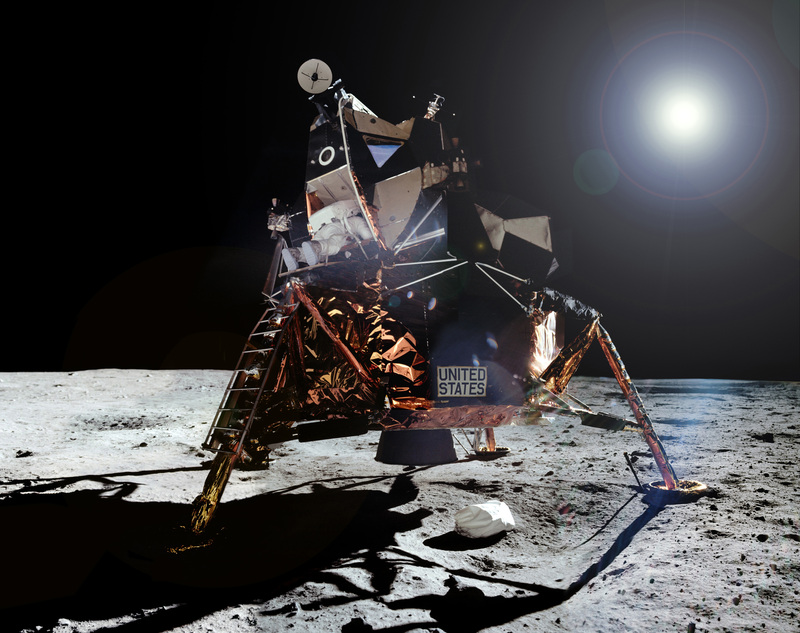 Panorama of the Eagle lunar module by Ed Hengeveld from JSC scans. I’m not sure what else need be said about the significance of what happened on this day in 1969, 43 years ago… it was a shining moment in human history, and will be — should be — remembered forever as an example of what people can achieve when challenged, driven and inspired. Maybe more giant leaps have been made since then, and undoubtedly more will be made in the future, but this was the first. After Armstrong stepped onto the lunar surface, Edwin “Buzz” Aldrin followed. Here’s a video of Buzz coming down the ladder… with a little direction from Neil. After he’s safely down, Buzz comments on the “magnificent desolation” of the Moon. And here’s a video made from 16mm color film taken from the LM as Neil Armstrong prepared to collect lunar samples… look at the brown color of the soil! Also, you can briefly make out Neil’s face inside his helmet.